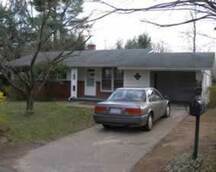 39 Ridgeway Drive in West Asheville - Leslie & Associates, Inc.
Ranch style home in great West Asheville neighborhood. 3 bedrooms, 1 bath. Oak hard wood floors through out with vinyl in the kitchen and bathroom. Living area with open floor plan into dining area. Galley style kitchen with refrigerator and range. Electric heat pump with central A/C. Washer/dryer hook ups in garage. Tenant pay electric and water, sewer, trash and yard maintenance. Pets ok with pet fees and approval. Large yard with a private backyard. Single car garage. West on Patton, Left on Bear Creek, Left on Narbeth, Narbeth turns sharply to the right and becomes Ridgeway. 39 Ridgeway is on the left.